2018 marks the 20th anniversary of LACUNA COIL’s debut. To celebrate this special year, the Italians played an exceptional show on January 19 in London at the O2 Forum Kentish Town. The unique, one-time event was filmed and recorded for “The 119 Show - Live In London”. Fans can look forward not only to a very special live performance that was accompanied by the UK circus group Incandescence, but also to a career spanning set including LACUNA COIL songs never played live before. The band comments: “What took place at the O2 Forum Kentish Town in London on the 19th of January 2018 was pure magic. It was definitely a once-in-a-lifetime experience for us as a band and as people. The work involved, the pre-performance tension, the intensity on stage, the energy between us and the audience – all of this was beyond anything we’ve ever done before. This event was not just a show, it was a birthday party, an anniversary celebration and most importantly a huge THANK YOU to everyone who travelled side by side with us for the last twenty years. 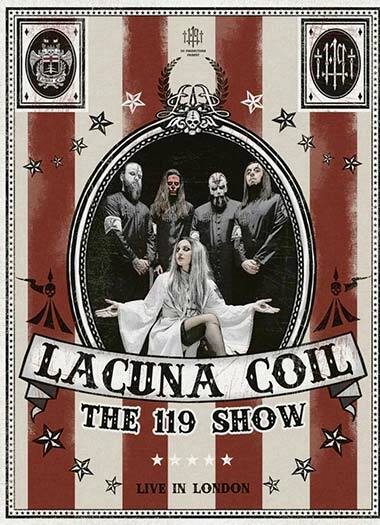 And now, with the release of ‘The 119 Show – Live In London’ we can also share the magic with those fans who weren’t able to party with us in January.” The DVD and Blu-ray offer two additional features: “Behind The Curtains” allows for a glimpse behind the scenes, before and after the show while “Enter The Coil” is an in depth interview with the band that was filmed in 2017. Enjoy close to 3 hours of unique and intimate audio-visual material from LACUNA COIL. “The 119 Show – Live In London” is available in the following formats: Ltd. Blu-ray+DVD+2CD Digipak, 2CD+DVD and Digital Album.